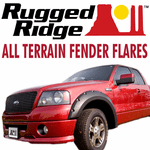 For all the off-road enthusiasts or those who wish they were, we carry a full line Prestige Fender Flares, Bushwacker Fender Flares, Rugged Ridge Fender Flares, and Universal Pacer Fender Extensions for trucks, SUV's and Jeeps. Prestige Fender Flares, Bushwacker Fender Flares, and Rugged Ridge Fender Flares are all among the top choices of off-roaders and everyday drivers, bringing tough materials, several styles and great looks to trucks and SUVs. Prestige and Bushwacker offer some great Fender Flares for drivers who want to keep the original manufacturer style as well as the Rivet style and Pocket style Fender Flares for added rugged styling. 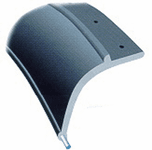 Prestige offers fender flares in a smooth or textured finish, the only of its kind; plus both finishes can be used as is without having to apply a coat of paint. Whatever your tastes may be, we have the Fender Flare for you.